I have had a full month now trading the soft books with the Trademate Sports software so how have things gone? First off lets look at the results for the first month using the Trademate Core product. Results for the first month have been very steady and I have ended the month almost exactly on the expected ev. In the graph above you can see that there has been a steady upward trend and with a slight draw down at the end of the month. So lets look at some of the stats provided with the Trademate tool. 8.2% fund growth – This statistic shows the growth on my initial investment. I quite like the inclusion of this metric as I have written previously about treating your sports trading as a business and this is a very professional way of looking at your betting/trading. £89 profit – This is the total current profit since using Trademate core. I am happy with this profit total as I have really gone into Trademate at the entry level using a £1000 bank. It should also be not that I opted to use the low Kelly staking plan for this trial as I prefer my betting to be slow and steady with an emphasis on protecting my bank. 3.6% Return on investment – Indicates the average return on my total turnover. 3.6% is a very good return especially when you consider that Trademate allows you to churn out a high volume of bets. I feel like now I am familiar with the software I could increase this volume next month. The Trademate software is very easy to use. Once you have set up the bookmakers you want to use there is something called the tradefeed which you can see in the above picture. 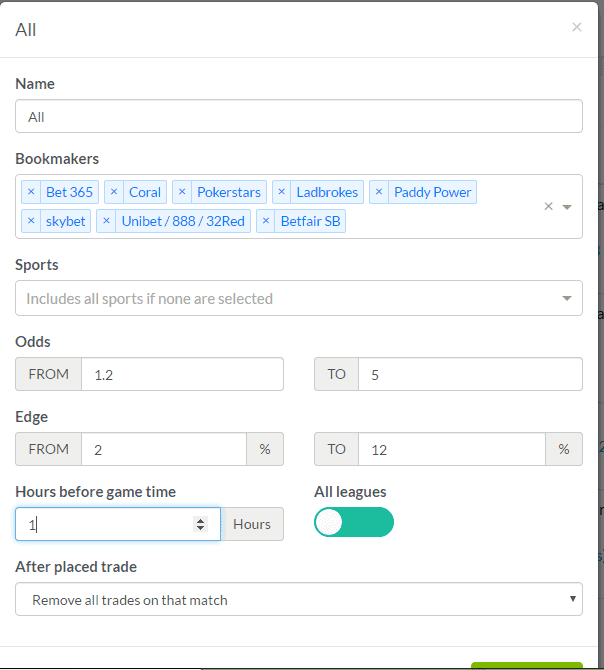 In the tradefeed there are a number of filters that you can adjust to your preference of odds range, edge percentage, sports, bookmakers and hours until the game starts. The software is very clean and easy to navigate. The edges that appear on your tradefeed are not always available once you access that market with whichever bookmaker it shows. This is no fault of Trademate, as these odds are offering value so whichever bookmaker that offers them will be looking to cut them quite quickly. The amount of time you have to get on these edges varies from bookmaker to bookmaker for example with Coral you may have 10 minutes or more but with Pokerstars you may only have 1 or 2 minutes. Initially I intended to only use the recommended leagues filter. This filter shows only games which are of high interest and liquidity. 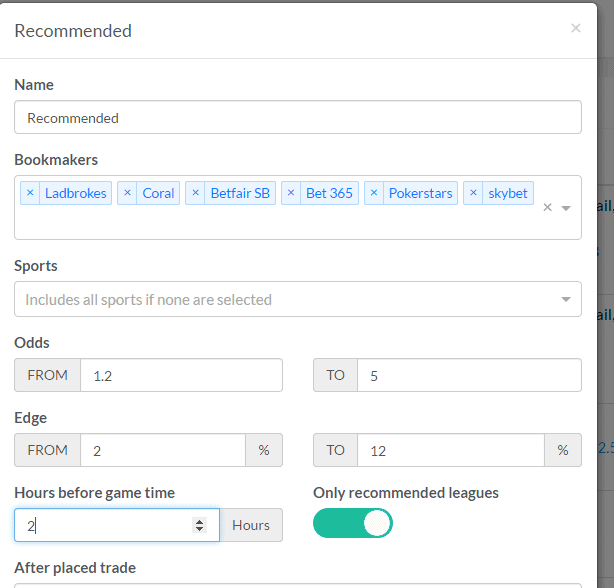 The idea behind the recommended filter is that it should make your soft bookmaker accounts last longer and disguise the fact that you are hammering them for value. I found though that I wasn’t going to be able to get in the volume of trades that I wanted for my bankroll and low kelly staking approach. After the first week I realised that I would need to add in some trades from the non recommended leagues. The all leagues filter will throw up any edges that occur from challenger tennis matches in Colombia to the Israeli Premier League. I don’t bet every edge that this filter throws up as betting on women’s Korean basketball is going to raise the eyes of any soft bookmaker whilst betting on an international rugby union doesn’t warrant as much attention. I am using this filter as a way of increasing my volume of bets when there my not be a lot of action on the recommended leagues. Something that I have been really impressed with is the community that the Trademate team are developing. They are in constant communication with current and prospective users of the Trademate software through emails and through a slack channel messaging group. The team behind Trademate sports are very receptive to ideas from the community and do a lot to educate any aspiring sports trader/bettor through their youtube videos and content center. Overall I am very positive about the product that Trademate Sports are offering it is quite unique and I can see that they are putting in a lot of effort to create something of value to their users. I will be back at the end of December with another update. In the meantime you can read more about Trademate on their official site below. Ryan Bruno is a former mixed martial arts and kickboxing competitor. He loves sports and making money online. After finishing university he played online poker and taught English for a living in Thailand for a few years. Upon returning to England his focus has been on making a living from sports trading, betting and arbitrage. WinnerOdds Review – Tennis Service That Has Made £40,487 Profit? Sports Betting Investment - Can You Make Money Sports Betting?